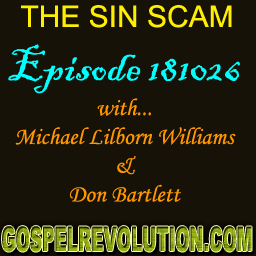 On this week’s Powercast, Michael and Don tackle Galatians 5 18-26. Paul said elsewhere that we were only enemy’s of God IN OUR MINDS and when that happens, we make ourselves “sinners”. We’re visiting a “Sin City” that only exists between our ears! YOU HAVE NEVER BEEN A SINNER. YOU HAVE NEVER SINNED! On this side of the Cross, “wrong” does not equal “sin”. Because what is “wrong” where you live (or what is illegal) is NOT necessarily wrong where others reside. Laws differ in various regions. However, Christianity teaches that “wrong” and “sin” are synonymous and so, too, are “good” and “righteousness”. If you break the law in your city, then you have done wrong. Then the question about “sin” becomes, have you actually sinned because you break the law of your government or have you just done wrong? Have you ACTUALLY sinned? Or are you a sinner only in your imagination? Hi Mike and Don.. thanks for this teaching it is fantastic as always..
Will be sharing it with my friend..
realize Christ has fulfilled all this for us. At least that’s my way of looking at this.